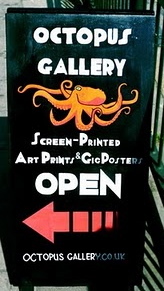 Octopus Gallery in Brighton UK shows a mix of screen printed gigposters and art prints. I'm happy to be showing a selection of each as part of their mix. I'm almost out of the Octopus' Garden 3D print, but I had to send one over for the Octopus Gallery Opening. Thanks Rhys!